The Institute of social sciences and humanities – Skopje, with the support of the Rosa Luxemburg Stiftung Southeast Europe, announces a call for participants for the School for politics and critique with the participation of the following keynote speakers: Ray Brassier, Oxana Timofeeva, Agon Hamza, Katerina Kolozova and Davor Löffler. In the detailed program attached below you will find the full list of titles, workshops and participants. The ‘School for Politics and Critique” is an educational and emancipatory platform of the Institute of social sciences and humanities – Skopje supported by the Rosa Luxemburg Stiftung Southeastern Europe. The School started on 2014 and it aimed to strengthen the Marxist and social critique in Macedonia through a series of workshops and lectures dedicated to activists and theorists. It total, there were 20 sessions and workshops organized until 2017 with more than 600 participating activists and 32 lecturers including theorists, philosophers, political activists, journalists and public intellectuals. This year, we intent to continue to connect the local and the regional activist and theoretical scene in a format that will enable an exchange of experiences of action, will help to think and rethink conceptual frameworks of political strategies and will contribute to the process of developing a regional political reference for the new emancipatory and political-left movements. 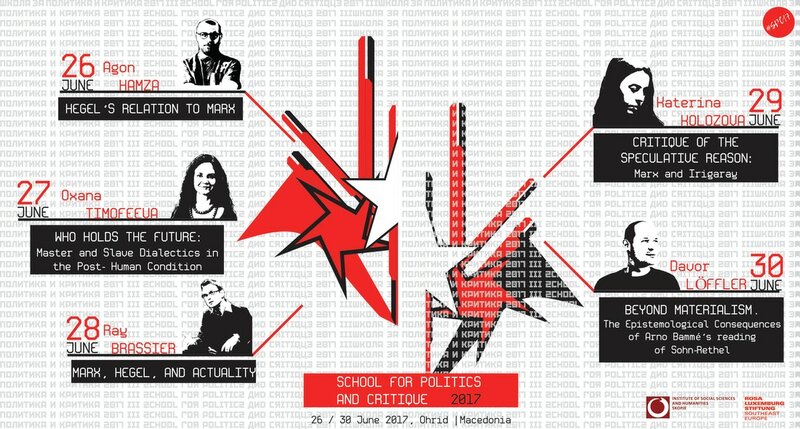 "School for Politics and Critique 2017" will be organized in the format of a summer school for activists and theorists of the Left from the region of Southeastern Europe. It will address current political issues in the region, looking at possible regional strategies to respond to the changing European context, by way of relying in Marxist and feminist thought. The School aims to explore current streams in political though relevant to rethinking the political action of the left and other progressive groups in a time that increasingly provides more and more reactionary conditions within the system and the society. - Critique of the EU from an internationalist rather than nationalist perspective. Applicants are expected to present their papers during the workshops, thus, they are required to select one of the topics listed above and send an abstract of no more than 300 words along with their application. The event is planned to bring together 25 local and regional activists from Southeast Europe and scholars in an engaged debate on contemporary socialist and Marxist thought on political strategies of emancipation and it will be held on 26-30 Јune 2017 in Ohrid, Macedonia. Application: Interested participants are encouraged to send their application (available for download below) to the following email address: info@isshs.edu.mk. The deadline for submitting the applications is 30th of April 2017. Travel and accommodation: All the costs including travel and accommodation will be covered by the organizer. Participants are expected to arrive in Ohrid on 25th of June 2017. The school is organized by the Institute of Social Sciences and Humanities, Skopje with the support of the Rosa Luxemburg Stiftung Southeast Europe.